A delightful display of roses that will certainly make their heart skip a beat! 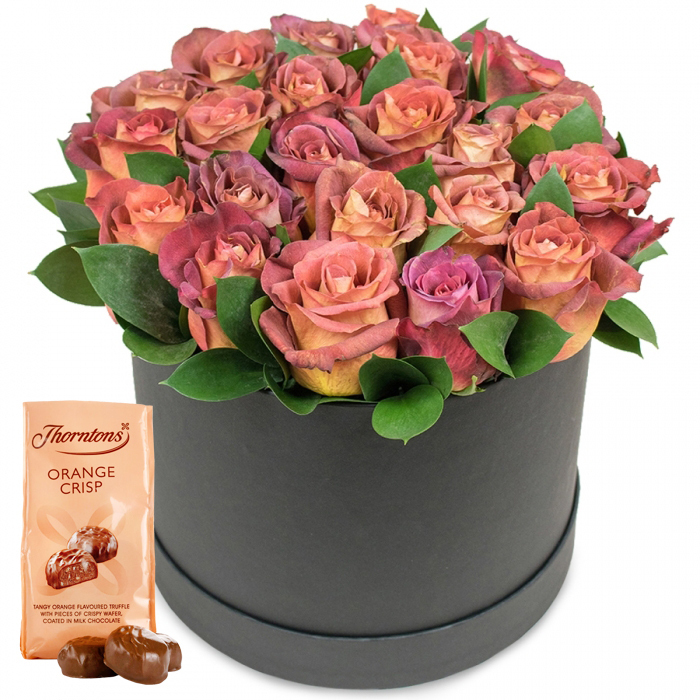 Send the most amazing surprise of flowers and chocolates to make their celebration even more fabulous! My wife is over the moon with this gift. The roses were so impressive and stately! To be honest, I've never order flowers online before, so was a little bit hesitant to ok the delivery. I chose same day flower delivery. As the weather was a bit off that day, I really did not think the flowers would get there on time...but they did! So happy, I really recommend this florist to anyone considering sending floral gifts for Valentine's Day. The flowers used by Handy Flowers are so fresh and vibrant, I love how they make such an impact. I received the flowers yesterday. All of the roses were placed safely in the box and formed a gorgeous circle. My wife is sure to fall in love with them, thank you dear florist! First class service from start to finish. I really appreciated the timely morning delivery! Thanks for the fresh flowers and chocolates.Good service. Wonderful box of flowers. Trust me when I say it - your significant other will definitely love it! (like mine did) 5 stars for the service. Freshly cut flowers! Prompt delivery and good communication. Chose these flowers for my lovely lady. She was totally in love with them. Received this flower box as a gift for Valentine's Day and the flowers looked spectacular. They are still fresh and I guess they will stay fresh at least a week more. Say thank you to your florists from me!!! Beautiful, hand-selected flowers arranged with great care and precision. Simply marvelous!